Travel Toilet Tissue Paper ( 6 rolls) + Bonus 20 toilet seat covers | Perfect for: Hiking, Camping, Travel, Office and RV. 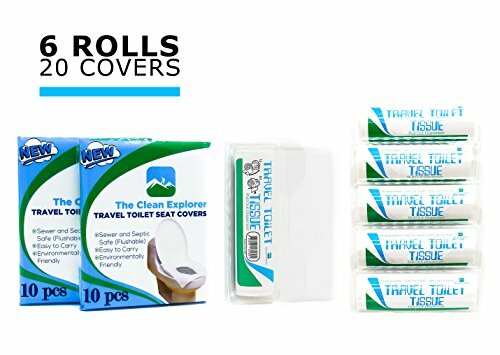 Travel Toilet Tissue Paper ( 6 rolls) + Bonus 20 toilet seat covers | Perfect for: Hiking, Camping, Travel, Office and RV. by The Clean Explorer at Water Sport Authority. MPN: The Clean Explorer. Hurry! Limited time offer. Offer valid only while supplies last. TRAVEL-FRIENDLY: The Clean Explorer travel size toilet paper is your ideal companion for your camping, hiking, office and holiday trips. They can fit into your backpack, Purse, Glove compartment and travel bags conveniently. They are produced with the best grade of pulp to guarantee a clean wipe without dustiness. PROTECTIVE CASE: Each roll comes in their own dispenser. Resealable after each use and keeps your toilet paper clean when stored in your bag, office or car. SEPTIC-SAFE AND ECO-FRIENDLY: Our toilet paper is septic-safe and suitable for use with standard sewers and septic systems. Our toilet paper is certified by Sustainable Forestry Initiative (SFI) and therefore, safe for the environment and the whole family. It dissolves quickly in the plumbing pipes and does not cause clogging of your plumbing systems. GREAT FOR PUBLIC RESTROOMS: Our soft toilet paper is perfect for those times the restrooms are out of toilet paper. Perfect for International travel! FREE 20 TOILET SEAT COVERS: Included are 2 packs of 10 toilet seat covers to protect you from germs in public toilets. They come in a travel size resealable bag. If you have any questions about this product by The Clean Explorer, contact us by completing and submitting the form below. If you are looking for a specif part number, please include it with your message. © 2019 - thunderbaytours.com. All Rights Reserved.